Set of 31 pieces of vintage Dorothy Thorpe’Allegro’ glass pieces. Iconic Mid-Century glassware with wide sterling silver bands around the rims. Elegant, classic, and beautiful! 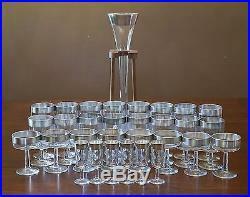 8 Water Goblets – 5.75 tall. 8 Iced Tea Glasses – 6.5 tall. 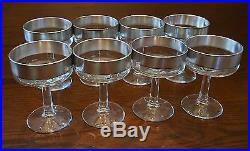 8 Champagne glasses / Sherbet cups – 4.5 tall. 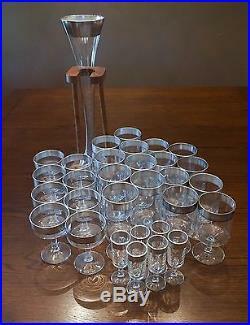 6 Cordial / Brandy / Shot glasses – 4.5 tall. 1 Bud Vase / Decanter / Yard Glass with wood stand – 16.75 tall (not 100% sure this piece is authentic Thorpe, but it looks identical to the other Allegro pieces). All pieces are in very good vintage condition. There are a few minor manufacturing flaws, which seems fairly common for this pattern, and some slight loss of silver on a few pieces which I tried to show in the photos. They are gorgeous as-is. The item “31 Pieces Mid Century Dorothy Thorpe Allegro Glassware Goblets Champagne Glasses” is in sale since Monday, September 11, 2017. This item is in the category “Pottery & Glass\Glass\Glassware\40s, 50s, 60s\Other 40s, 50s, 60s Glassware”. The seller is “stella_blue99″ and is located in Cologne, Minnesota. This item can be shipped to United States, Canada, United Kingdom, Denmark, Romania, Slovakia, Bulgaria, Czech republic, Finland, Hungary, Latvia, Lithuania, Malta, Estonia, Australia, Greece, Portugal, Cyprus, Slovenia, Japan, China, Sweden, South Korea, Indonesia, Taiwan, South africa, Thailand, Belgium, France, Hong Kong, Ireland, Netherlands, Poland, Spain, Italy, Germany, Austria, Russian federation, Israel, Mexico, New Zealand, Philippines, Singapore, Switzerland, Norway, Saudi arabia, Ukraine, United arab emirates, Qatar, Kuwait, Bahrain, Croatia, Malaysia, Brazil, Chile, Colombia, Costa rica, Panama, Trinidad and tobago, Guatemala, Honduras, Jamaica, Antigua and barbuda, Aruba, Belize, Dominica, Grenada, Saint kitts and nevis, Saint lucia, Montserrat, Turks and caicos islands, Barbados, Bangladesh, Bermuda, Brunei darussalam, Bolivia, Ecuador, Egypt, French guiana, Guernsey, Gibraltar, Guadeloupe, Iceland, Jersey, Jordan, Cambodia, Cayman islands, Liechtenstein, Sri lanka, Luxembourg, Monaco, Macao, Martinique, Maldives, Nicaragua, Oman, Peru, Pakistan, Paraguay, Reunion. Set of 31 pieces of vintage Dorothy Thorpe’Allegro’ glass pieces. Iconic Mid-Century glassware with wide sterling silver bands around the rims. Elegant, classic, and beautiful! 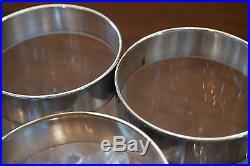 8 Water Goblets – 5.75 tall. 8 Iced Tea Glasses – 6.5 tall. 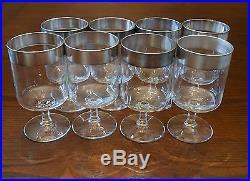 8 Champagne glasses / Sherbet cups – 4.5 tall. 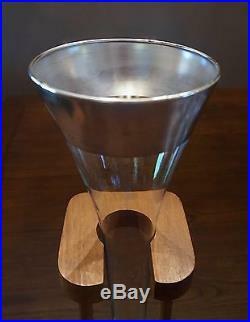 6 Cordial / Brandy / Shot glasses – 4.5 tall. 1 Bud Vase / Decanter / Yard Glass with wood stand – 16.75 tall (not 100% sure this piece is authentic Thorpe, but it looks identical to the other Allegro pieces). All pieces are in very good vintage condition. There are a few minor manufacturing flaws, which seems fairly common for this pattern, and some slight loss of silver on a few pieces which I tried to show in the photos. They are gorgeous as-is. The item “31 Pieces Mid Century Dorothy Thorpe Allegro Glassware Goblets Champagne Glasses” is in sale since Thursday, June 29, 2017. This item is in the category “Pottery & Glass\Glass\Glassware\40s, 50s, 60s\Other 40s, 50s, 60s Glassware”. The seller is “stella_blue99″ and is located in Cologne, Minnesota. This item can be shipped to United States, Canada, United Kingdom, Denmark, Romania, Slovakia, Bulgaria, Czech republic, Finland, Hungary, Latvia, Lithuania, Malta, Estonia, Australia, Greece, Portugal, Cyprus, Slovenia, Japan, China, Sweden, South Korea, Indonesia, Taiwan, South africa, Thailand, Belgium, France, Hong Kong, Ireland, Netherlands, Poland, Spain, Italy, Germany, Austria, Russian federation, Israel, Mexico, New Zealand, Philippines, Singapore, Switzerland, Norway, Saudi arabia, Ukraine, United arab emirates, Qatar, Kuwait, Bahrain, Croatia, Malaysia, Brazil, Chile, Colombia, Costa rica, Panama, Trinidad and tobago, Guatemala, Honduras, Jamaica, Antigua and barbuda, Aruba, Belize, Dominica, Grenada, Saint kitts and nevis, Saint lucia, Montserrat, Turks and caicos islands, Barbados, Bangladesh, Bermuda, Brunei darussalam, Bolivia, Ecuador, Egypt, French guiana, Guernsey, Gibraltar, Guadeloupe, Iceland, Jersey, Jordan, Cambodia, Cayman islands, Liechtenstein, Sri lanka, Luxembourg, Monaco, Macao, Martinique, Maldives, Nicaragua, Oman, Peru, Pakistan, Paraguay, Reunion. Set of 31 pieces of vintage Dorothy Thorpe’Allegro’ glass pieces. Iconic Mid-Century glassware with wide sterling silver bands around the rims. Elegant, classic, and beautiful! 8 Water Goblets – 5.75 tall. 8 Iced Tea Glasses – 6.5 tall. 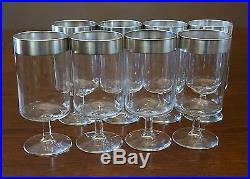 8 Champagne glasses / Sherbet cups – 4.5 tall. 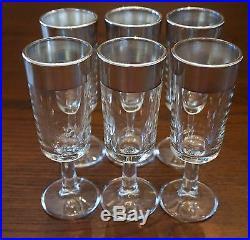 6 Cordial / Brandy / Shot glasses – 4.5 tall. 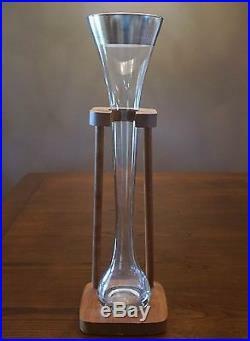 1 Bud Vase / Decanter / Yard Glass with wood stand – 16.75 tall (not 100% sure this piece is authentic Thorpe, but it looks identical to the other Allegro pieces). All pieces are in very good vintage condition. There are a few minor manufacturing flaws, which seems fairly common for this pattern, and some slight loss of silver on a few pieces which I tried to show in the photos. They are gorgeous as-is. The item “31 Pieces Mid Century Dorothy Thorpe Allegro Glassware Goblets Champagne Glasses” is in sale since Tuesday, May 30, 2017. This item is in the category “Pottery & Glass\Glass\Glassware\40s, 50s, 60s\Other 40s, 50s, 60s Glassware”. The seller is “stella_blue99″ and is located in Cologne, Minnesota. This item can be shipped to United States, Canada, United Kingdom, Denmark, Romania, Slovakia, Bulgaria, Czech republic, Finland, Hungary, Latvia, Lithuania, Malta, Estonia, Australia, Greece, Portugal, Cyprus, Slovenia, Japan, China, Sweden, South Korea, Indonesia, Taiwan, South africa, Thailand, Belgium, France, Hong Kong, Ireland, Netherlands, Poland, Spain, Italy, Germany, Austria, Russian federation, Israel, Mexico, New Zealand, Philippines, Singapore, Switzerland, Norway, Saudi arabia, Ukraine, United arab emirates, Qatar, Kuwait, Bahrain, Croatia, Malaysia, Brazil, Chile, Colombia, Costa rica, Panama, Trinidad and tobago, Guatemala, Honduras, Jamaica, Antigua and barbuda, Aruba, Belize, Dominica, Grenada, Saint kitts and nevis, Saint lucia, Montserrat, Turks and caicos islands, Barbados, Bangladesh, Bermuda, Brunei darussalam, Bolivia, Ecuador, Egypt, French guiana, Guernsey, Gibraltar, Guadeloupe, Iceland, Jersey, Jordan, Cambodia, Cayman islands, Liechtenstein, Sri lanka, Luxembourg, Monaco, Macao, Martinique, Maldives, Nicaragua, Oman, Peru, Pakistan, Paraguay, Reunion.